WOW!! Ang dami mo nang napanood ah! Lol. I'll surely check out some that I haven't seen yet. REALLY REALLY REALLY JEONGMAL RECOMMEND A WEREWOLF BOY!!! Such a beautiful movie! Anyone who watched the "3 Idiots"? Two friends are searching for their long lost companion. They revisit their college days and recall the memories of their friend who inspired them to think differently, even as the rest of the world called them "idiots"
OMG. I just watched "3 Idiots" yesterday and I like like it! If you want a laugh trip, try watching it. It's so nice talaga. Hehe. It's about their college life and their friendship na super na touch ako. Aayyeeeee! I wasn't able to sleep while watching this even after my crazy shift, so, it's not that boring. hehe. Maybe in the first part while they keep on singing (I think, most of Indian movies has lots of singing and dancing, so it's normal for this movie). I think it's in youtube already. Not sure though. meron ng werewolf boy? gee. ang bilis naman, hinihintay ko yun matagal na. 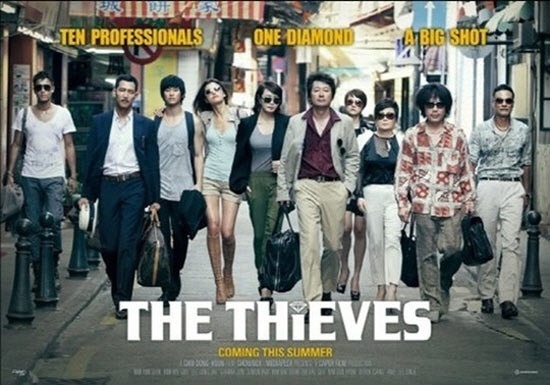 napanood ko na yung the thieves. it was good. ang hot ng kissing scene nina jihyun at soohyun. napanood ko na rin yung 3 idiots, super ganda nun. may isa pang movie si aamir khan, about sa isang special child - Taare Zameen Par. maganda yung message ng movie. favor~ can you please watch YES OR NO and it's sequel YES OR NO 2 (meron nito sa youtube) starring Aom Sushar Manaying (@aom_sushar), yung girl na girl sa movie and Tina Suppanad Jittaleela (@tiniiz), yung girl na tom <- this girl is so handsome, hindi mo aakalain na tomboy sya, pero kahit na tomboy sya, hindi sya trying hard, she knows na girl sya. it's a lesbian film pero hindi siya disgusting. pure yung love story nila. actually may project ang fans ni Aom na dalhin sya dito sa october, pero kulang sa budget so naghahanap sila ng sponsors. hopefully madala din nila si Tina dito. we need more fans, hehe! may Thai version nga pala ang Autumn in my Heart ni Song Hyegyo na pinalabas sa kabila, at ang bida dito ay si Aom. Exciting ng thieves noh? kaya nga lang nabitin ako sa storyline ni soo hyun. The poster and still cuts for the upcoming movie “Secretly and Greatly” have been revealed, drawing attention to the gathering of “flower boy” actors playing the role of spies. Kim Soo Hyun plays the lead role of Dong Gu who is the village idiot in a small South Korean town by day, but by night, he is the North Korean spy, Ryu Hwan. Kim Soo Hyun is prominently featured in the main poster for the movie as the character of Dong Gu, wearing a green track suit with cheap rubber slippers. Kim Soo Hyun bears a bright but foolish smile on his face that does not correspond at all to his character’s real identity as a spy. Park Ki Woong also plays a North Korean spy pretending to be rocker who fails at every audition. He sports bright orange hair in the movie to colorfully portray his character. Lee Hyun Woo completes the spy trio, playing the role of Hae Jin who is a highly skilled, cold-hearted spy pretending to be a normal high school student. The movie is set to premier in June of this year. EXCITED!! Kim Soo Hyun and Lee Hyun Woo in one movie!! Has anybody watched the J-Movie One Missed Call? Please try to review the Japanese film Koizora. Promise po worth it un if ipapalabas sa kapamilya. > Paradise Kiss - must watch! The individual posters for the three leads of the upcoming movie, “Secretly and Greatly” have been released. “Secretly and Greatly” tells the story of three North Korean spies sent to South Korea and each takes on an alternate ego to disguise their true identity. Kim Soo Hyun plays the role of Ryu Hwan, who acts like a village idiot to hide who he really is. Park Ki Woong plays Hae Rang, who pretends to be a guitarist. Lee Hyun Woo takes on the role Hae Jin, who pretends to be a normal high school student. Each poster prominently features each actor portraying their characters just through their facial gesture. Park Ki Woong gives off a chic smile that portrays Hae Rang’s carefree artist lifestyle. His tagline reads, “Whatever we do, shouldn’t it be fun?” Kim Soo Hyun gives a huge, bright smile to portray the innocence of his alter ego. His tagline reads, “Born as a wild dog, raised like a monster, infiltrate as an idiot.” Lee Hyun Woo’s tagline reads, “I am this neighborhood’s observer.” His eyes portray the tension of being a spy, who must always keep his eyes and ears open. “Secretly and Greatly” will premier June 5 in theaters.